Instructions: Cut a piece of cream cardstock 12" x 6", score along the long side at 6" to make a base card of 6" x 6". Cut a piece of kraft cardstock at 6" x 8" and die cut the edge using the flourish die from the DHD1-7119 Delicate Border Basics Die. Adhere to the base card front. Cut a piece of yellow patterned paper 6" x 2" and using the edge die from the HCD1-7118 Classic Border Basics set and adhere to the kraft cardstock as shown. Cut a 6" x 6" panel from the patterned paper, sponge the edges with Canteloupe ink and adhere it to the card front as shown. 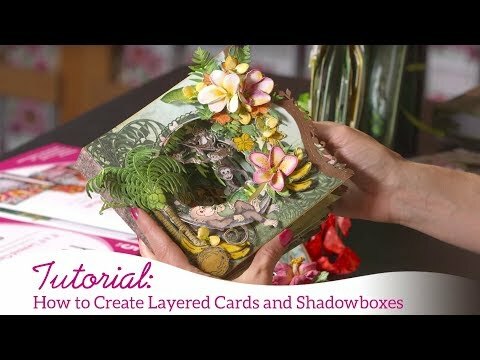 Assemble the 5" x 5" box card and adhere to the card front. Trim a 6" x 6" panel to 5" x 5" to fit in the back of the shadow box. 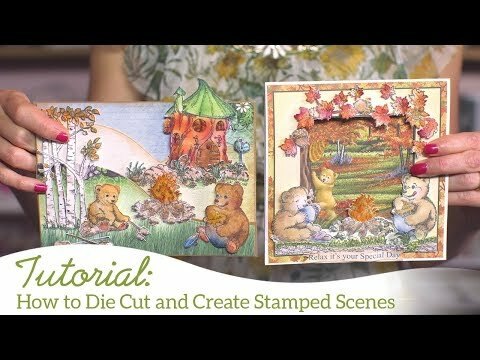 Cut strips of 5" x 1/2" from the leaf patterned paper, sponge the edges with Cantaloupe ink and adhere on the sides of the shadow box. Cut another piece of patterned paper 5" x 5" and using the square die from the HCD2-751 Cut Mat Create 2A Die set cut the centre from the panel. Sponge the edges with Cantaloupe ink and adhere to the front of the shadow box. To make the trees stamp the images from the HCPC-3766 Woodsy Treescape Stamp set using Tuxedo black ink on white cardstock. Sponge with a combination of Cantaloupe, Morocco, Bamboo Leaves and Tangelo inks using the Stack and Store Daubers. Using the Dove Blender pen colour the trunks with Toffee Crunch ink and die cut the trees using the coordinating dies. Adhere the large tree to the left side of the shadow box and the other trees inside the box using a single layer of foam dots and a double layer of foam dots. To make the leaves stamp the leaf images from the HCPC-3799 Sunflower Accents Stamp set in Tuxedo Black onto white cardstock and sponge with a combination of Morocco, Bamboo Leaves, Canteloupe and Tangerine. Die cut with the coordinating dies. Shape with the Deluxe Flower Shaping kit and adhere along the front of the box as shown. Stamp the border image from the HCPC-3799 Sunflower Accents Stamp set in Tuxedo Black and sponge the leaves with a combination of Morocco, Bamboo Leaves, Cantaloupe and Tangerine inks. Sponge the acorns with a combination of Toffee Crunch and Espresso Truffle and the sunflower with Cantaloupe and Morocco inks and die cut with the coordinating dies. Shape with the Deluxe Flower Shaping kit and adhere along the top of the box as shown. Add extra acorns to the bottom of the card with foam dots. To make the bears, stamp the images from the HCPC-3797 Beary Fun Retreat Stamp set using Tuxedo Black ink onto white cardstock. Sponge with Butter, Summer Sky, Cantaloupe and Toffee Crunch inks with the Stack and Store Daubers before die cutting with the coordinating dies. Sponge the edges with Potter's Clay and Rich Cocoa inks. Stamp the campfire and marshmallow stick images from the HCPC-3797 Beary Fun Retreat Stamp set onto white cardstock using black ink. Sponge the fire with Canteloupe and Morocco inks and the tinder with Toffee Crunch ink and the marshmallow stick with Toffee Crunch, Flannel Grey and Rich Cocoa ink. Adhere the bear with the honey pot to the inside of the box with foam dots. Adhere the bear with the hot drink to the left over the leaves using foam dots. Adhere the marshmallow behind the bear to sit over the fire. To make the Sunflower stamp the images from the HCPC-3626 Classic Sunflower Stamp set in Morocco ink on white cardstock. Sponge the flowers with Cantaloupe ink and die cut from the coordinating die. Sponge the edges with Morocco ink and shape using the Deluxe Flower Shaping Kit. Assemble the flowers and add Espress-O Yourself Prills to the centre of the flowers using Dries Clear Glue. Adhere to the sunflower in the centre of the border image. Die cut the tags from the paper collection using the dies from the Luggage and Tags dies. Sponge the edges with Cantaloupe ink and adhere to the card on the top right corner of the shadow box. Tie a bow using the hemp twine and adhere over the tags as shown. If desired cut a piece of patterned paper 6" x 6" on the inside of the card.